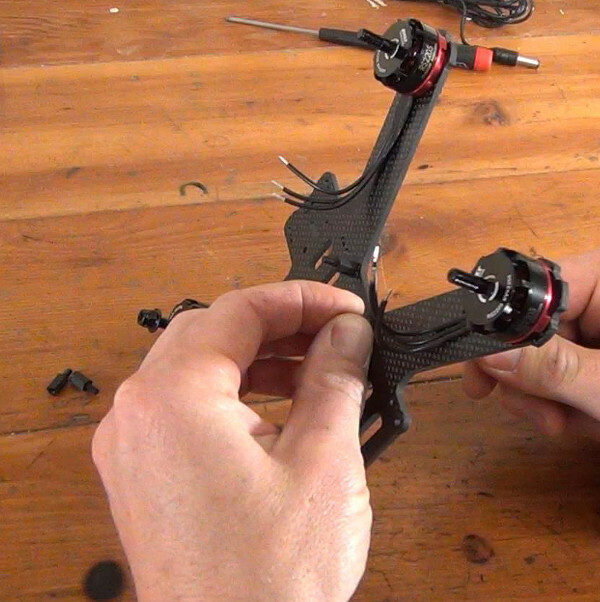 This is part 2 of our instructional series of how to assemble a racing drone. In this series, we are building a Lisam 210 frame and in this article, we assemble the frame and motors. Check out the introduction post for more information about the series. 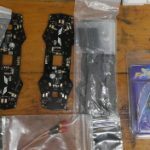 Your racing drone frame kit, which should include carbon fiber plates, and hardware which may include hex bolts, aluminum standoffs and/or nuts. It makes the edges less sharp and therefore less likely to hurt you if you catch the racing drone out of the air or pick it up quickly. It provides some protection against carbon fiber delamination – which is where the individual sheets of carbon fiber that are glued together to make the plates you are working with start coming apart. This step is not required, but we do recommend it if you have the tools and patience. You do need to be aware that when sanding dry carbon fiber, dust is emitted which is a strong carcinogen. If you sand carbon fiber dry, do it outside away from people and pets and wear a dust mask. 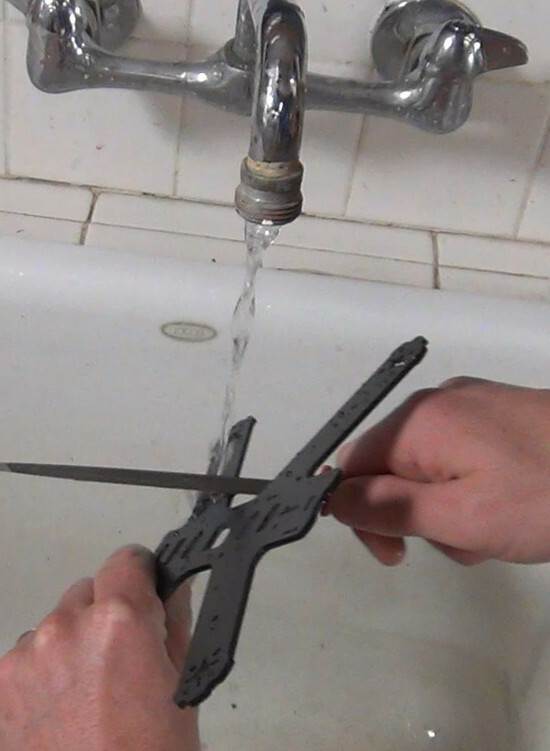 Another option is to do it under a sink, which prevents the dust from getting airborne and washes it down the drain instead. Regardless of whether you do the filing wet or dry, the process is the same. Draw the metal file across all of the carbon fiber’s edges, similar to how you would sharpen a knife. The end result you are looking for is that the edge will become rounded off and dull to the touch. 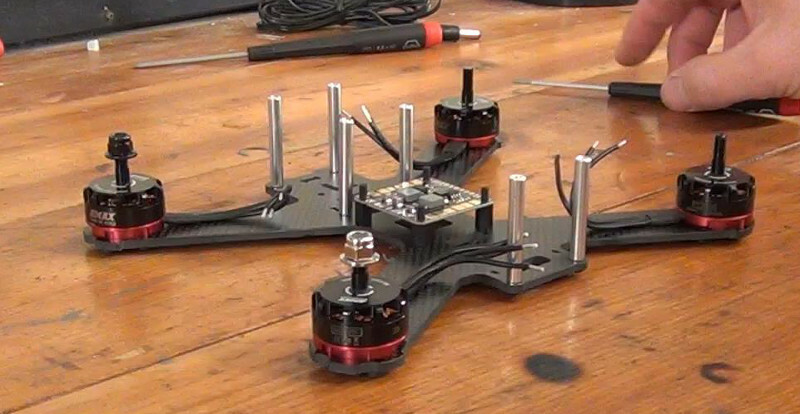 If you’ve never built a drone racer before, it might be useful to you to do a dry fit of all the frame components. This will give you an idea of how it all goes together and what it will look like when you are done. Generally, everything will screw into different holes in the lower carbon fiber plate. This is usually the thickest plate. 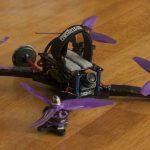 You should reference the build log for your quadcopter when you get confused. Once you’ve figured that out, take everything apart except for the arms, if they are removable. We are going to start the real build by screwing on the motors. 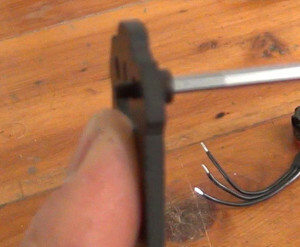 Remove each motor from it’s packaging along with the hex bolts that should come with it. Thes bolts are used for securing the motor to the carbon fiber frame. Most motors will come with at least two different lengths of hex bolts – it is up to you to determine what length to use. You do this by inserting each length into the motor bolt holes in the underside quadcopter arm and seeing how much of the bolt protrudes out of the top of the arm. You are looking for a bolt length that protrudes at least 5 of it’s threads, but ideally not more than 10. The idea is you want enough of the bolt coming out to grip the motor and hold it tightly onto the frame, but bolts that are too long will actually screw into the motor’s internal wiring causing it to short and die. We’ll check for this once we actually install the motor. The bolt length extruding from the arm in the picture on the right is a good baseline. Once you’ve found the correct motor bolt length, pull out a total of 16 of those bolts for use with each of the 4 motors and store the rest of the hardware that came with your motors in your spare parts kit (or the trash can if you don’t want to keep them around). You are going to use 4 bolts per motor. 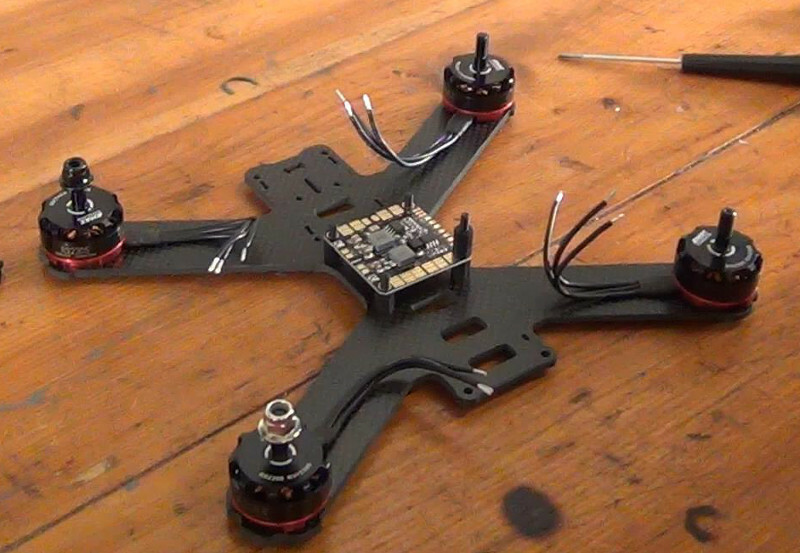 Some experienced builders like to use 3 or even 2 bolts per motor to save a few grams of the build weight – but you should use all four for your first quadcopter. Time to bolt the motors to your frame. If these bolts fall out in flight, the damage will be catastrophic. Since they are attached to the motor, which can have high-frequency vibrations, this is a very real possibility. Therefore we will use blue loctite to “glue” the bolts in place. 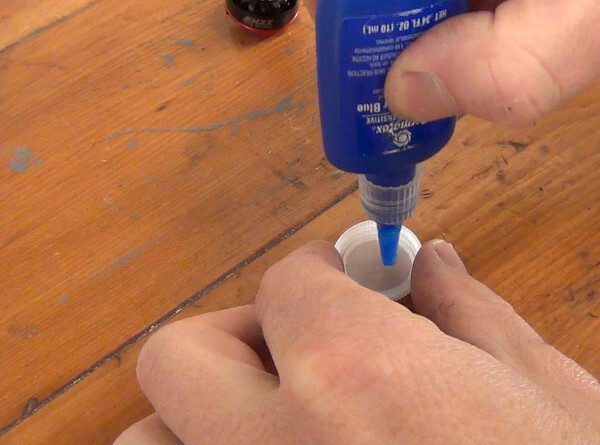 We like to apply the loctite by making a nice pool of it on some plastic packaging or in a bottle cap. 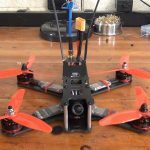 Now, line up one of your motors on your quadcopter’s arm so that the wires are pointing inward along the carbon fiber arm. Dip one of the motor bolts in some threadlocker and carefully screw it into the motor through the frame’s bolt holes. Just snug the bolt up but do not fully tighten it – you want to be able to move the motor around if necessary. Repeat this with the rest of the bolts for the motor in a criss-crossing pattern: put one bolt in, then add the adjacent bolt – and so on. Once all four bolts have been screwed in for the motor, check the alignment of the motor by looking through the hole in the bottom of the arm plate. 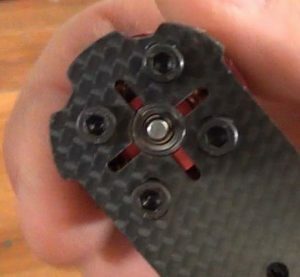 You are looking to see that the circular bearing holding the motor shaft is perfectly centered in the carbon fiber arms. Once you’ve got the motor centered properly, it’s time to tighten the bolts. Remember: you are screwing an aluminum bolt into an aluminum motor casing, so do not torque this like you would a lug nut or an oil pan bolt. 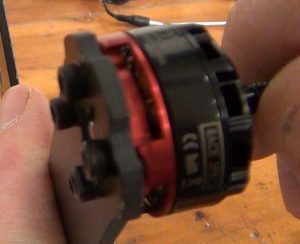 “Finger snug” is what we like to use – torque the bolt with just your index finger and thumb with a decent amount of force. By only using two fingers you will limit the total amount of torque you can lay down. Next, hold the motor upright and peer in through the small gaps at the bottom of the motor bell. You are looking to see if you notice the motor bolts poking through the bottom of the motor body and contacting the golden motor windings inside of the motor. If you see bolts contacting anything other than the body of the motor, remove them and use smaller bolts – failing to do so will destroy your motor quite quickly. Finally, spin the motor with your fingers. Do you encounter any resistance or hear any odd sounds? Compare the motor bolted to the frame to the freshly unboxed motors you have laying on your work bench. Make sure they sound and feel the same while spinning them. If they don’t, try to find what is binding the motor on the arm up. Try loosening the bolts if you are having problems. That’s one motor, now repeat this same process on the other four. The next step to frame assembly is installing your power distribution board, or PDB. 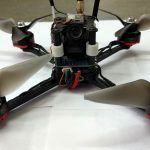 We describe this component in detail in this article – the reason we are installing it now is it will serve as the focal point from which you will solder all of the rest of the electronics on the quadcopter. Therefore it is important to get the PDB on early so that you can make the correct measurements and decisions in the following build steps. 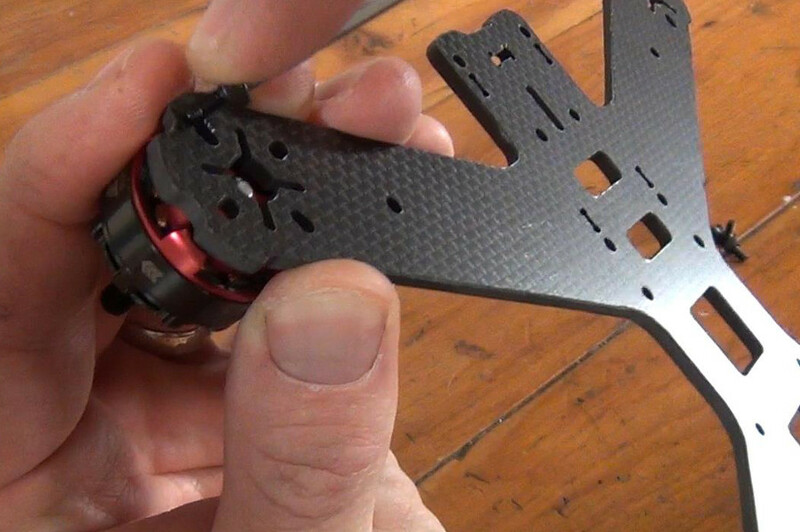 When installing any electrical component on a carbon fiber quadcopter frame, you must remember that carbon fiber conducts electricity. Therefore, it is critical that you make sure that no electronic component is sitting directly on top of carbon fiber. This is especially important for the PDB, which distributes the comparatively volatile battery voltage to all the components on the drone racer. To properly isolate the PDB from the frame, most builders use M3 nylon standoffs. For some reason, these are rarely included in racing drone frame kits, so you’ll need to pick them up yourself. Fortunately you can purchase a nice bulk kit of them for cheap – our favorite can be bought off of Amazon here. This kit includes enough standoffs to build 10+ drones. Screw four of the nylon standoffs to the top side of the frame plate. You can use any screw for the standoff – the nylon screws that come with most standoff kits or the aluminum ones that came with your frame kit. Do not use threadlocker on these screws – it is not an effective glue when used with nylon and can actually damage the standoff. Once you are done, you should be able to place your PDB board on top of the nylon standoffs. We like to screw 1 or 2 additional standoffs onto the posts extruding from the PDB to hold it down, as is pictured above. At this point, you’re pretty close to being done assembling your frame. The last step we like to do is to screw in the aluminum standoffs which secure the top plate of the frame to the lower plate. The reason we put these in now is they will aid you in running the various wires used by the quadcopter around the frame. It’s not required, but we definitely recommend it. When installing the standoff, use the bolts provided with the frame kit. You can use thread locker for the aluminum standoffs but we don’t – if these bolts fall out it generally isn’t catastrophic and you will notice it quickly. Also they are not subjected to vibration like the motor bolts are. Next up, we’ll start soldering!